graduation photo booth props: new! Schools (almost) out for summer! I can almost smell the pomp and circumstance, can you? 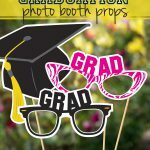 So while you get ready for grad night or for your preschooler to don the cap and gown, check out our printable Graduation Photo Booth Props.